Just get on with it! Phrasal verbs with ‘get’. My last blog about phrasal verbs attracted a lot of comments. Many of them were from people who find phrasal verbs difficult. One reason is that so many of them are formed with very common verbs such as get, give, set, or put. I totally understand why this is a problem, and as I often say to my students, I do apologise for the English language! However, saying sorry won’t help, so here is the first in a series of blogs looking at phrasal verbs formed with common verbs, in this case get. Firstly, it may sound obvious, but start by learning the most common phrasal verbs. A good place to begin is with a small learner’s dictionary. For example, the Cambridge Essential Dictionary, written for beginners, has only 9 phrasal verbs with get. In other words, the people who wrote that dictionary have already chosen the most useful ones for you. If you get away with doing something bad (or not doing something you should do), nobody punishes you for it: He never does his homework. I don’t know how he gets away with it. If two people get on or get on with each other, they like each other and are friends. This phrasal verb is used in British English, but not American English: Do you and your sister get on? If you were ill or sad, but you get over it, you feel better: I had the flu, and it took weeks to get over it. And finally, for anyone who noticed the title of this blog, get on with it is a rather rude way of telling someone that they should start doing something immediately! Hi Sergio. It’s fine to say either – get on or get on well. I got off/on the bus in the city centre. (= LEFT/ENTERED the bus), people will get confused otherwise. To add a footnote from across the Atlantic, we Americans say “get along with” to describe a working relationship among people. At the same time, I should point out that Americans and Brits are pretty good at understanding each others’ idioms, especially in cosmopolitan cities like London and New York.So try your best English and it’s likely to work. I’m italian and my former Pm was Silvio Berlusconi. Please, get over it! They are very useful. Thanks for sharing them. Hi, Thanks very much for this article. I would like to have your information about the difference between ‘get away with’ and ‘get out of’? As it seems both of them are with the same meaning of not being punished by people when someone did something bad. Thanks. because, As I know, for me. the word of ” Get out of sth” is doing sth you shoud do and at the end ( finally ) you’re done! For the other word ” get away with” is not doing sth you shoud do and at the end ( finally ) you didn’t and you’re not being punshed by someone, in a manner of speaking you passed, right? get away with sth= not to be punished for doing sth bad.-> If he always gets home late, don´t let him get away with it. get out of sth= not to do sth you should to->you´re always getting out of paying me a cup of coffee. Hi Melinda. Usually, we say ‘get out of’ to talk about someone who somehow manages not to do something they should do. For example: I should be at a meeting tomorrow, but I’m going to try to get out of it./It’s Fred’s turn to do the washing up – don’t let him get out of it! So it’s a bit different from ‘get away with’, which is used after someone has done something bad. Yes, they are quite difference. I was confused. Thanks so much for explanation. May I have another question for you? What is the difference between “go to work” and “get to work”. The main difference is that we usually use ‘get to work’ to talk about *arriving* there: I get to work around 8am./It took me two hours to get to work this morning. We use ‘go to work’ more for talking about leaving the house or about the journey: What time do you go to work?/I go to work by bus. hi, guys I have a doubt about the phrasal verb ” to be in one’s shoes ” is there anyone here who can give me a clear explanation about it? Hi Rafael. That’s an idiom, not a phrasal verb, and it means something like ‘to experience what I’m experiencing’. So we can say, for example: ‘What would you do if you were in my shoes?’. For queries like this, it’s a good idea to look in the online dictionary on this site – there is a good entry for the idiom ‘be in sb’s shoes’ that will give you the information you need. Hope that helps! Rafael,, if I were in your shoes. be in sbd´s shoes= be in sbd´s position.-> I´d stop loving her if I were in your shoes. Even though I was happy to get to know that I know all of them, thanks for reminding a very useful piece of knowledge. 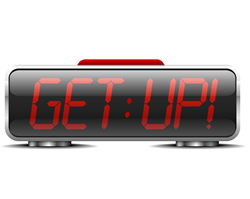 Meaning ” to get up” is ” move out of bed or stand up”, What else is there anything ?